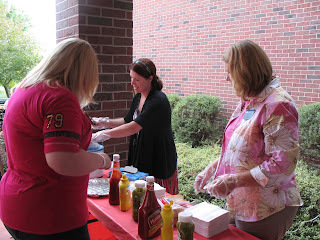 Christine Reimund, academic advisor, and Rebecca Gordon-Bocklage, director, serve Fallon Muir at the Jefferson City campus’ Welcome Back Bash. Columbia College–Jefferson City held a Welcome Back Bash for its students on Aug. 17 and 18. Faculty and staff joined students for a barbecue event with hot dogs, soda and music. The campus continues to introduce social and academic community events to serve its students.